Leaving the war behind, Kelli (Cardellini) can't wait to re-join her old life in the rust Belt town she's always known. She is ready to experience the old feelings of everyday life again, to enjoy the most mundane smells and touches that everyone safely at home knows well. 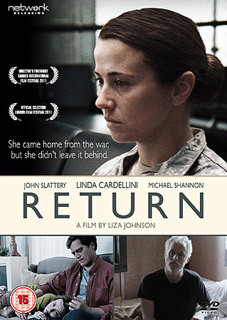 Liza Johnson's understated story of a military worker returning home after a tour of duty stars an ensemble cast of Linda Cardellini, Michael Shannon and John Slattery. The drama was financed by the Sundance Laboratory and premiered to high acclaim at the Cannes Film Festival 2011. Return (cert. 15) will be release on UK DVD on 6th August 2012 by Network Releasing at the RRP £14.99.